"Serve this simple Japanese dish over thin Japanese noodles or rice, if desired." Heat oil in a large skillet or wok over medium-high heat. Brown beef in hot oil, then stir in soy sauce, MSG, broth, and sugar. Mix in onion and celery, and cook until tender. Stir in bamboo shoots, green onions, mushrooms, and water chestnuts. Reduce heat to medium, stir in cornstarch, and simmer until sauce is thickened. Watch Yasuko make soul-warming Japanese sukiyaki. This is in no way an authentic Japanese recipe for Sukiyaki. It's more of a stir fry. Not authentic and didn't taste anything like the real version of Sukiyaki. While it tasted fine(skipped the MSG), this is in no way Sukiyaki. A simple search on google would have shown that. This was very good. Since I don't keep MSG on hand, I didn't put any in the recipe and certainly didn't miss it. Next time, I plan to cut down on the amount of sugar. Overall, excellent! 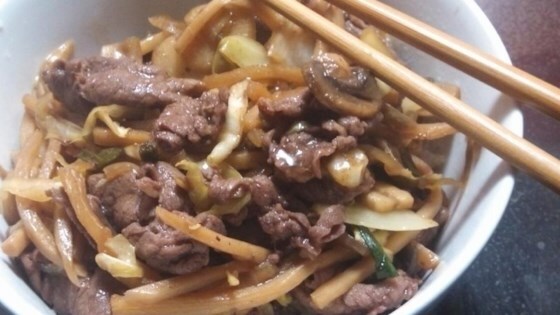 As another reader noticed, this is a beef stir-fry and not Sukiyaki. MSG? Chicken broth? Use dashi stock with soy and mirin instead, or better yet, buy some warishita (sukiyaki cooking sauce). Very easy and very yummy! Easy to change up and still tastes great! My husband loved this. I've made it a lot because it's easy and quick. Hamburger works fine if you don't have the sirloin.